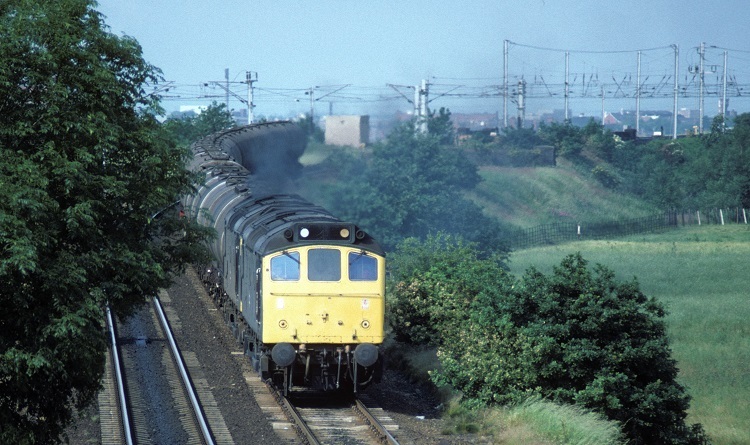 Photograph courtesy Roger Geach 25321 & 25249 at Acton Grange, Warrington with Leeds - Stanlow oil empties on July 2nd 1986. The nineteen year career of D7671/25321 was spent allocated to a multitude of London Midland Region depots. Dual brake equipped (April 1978). Time between last Classified repair and withdrawal: 100 months. March 1967 to Nottingham Division (D16). July 1972 to Birmingham Division (D02). May 1973 to Carlisle Kingmoor (KM). January 1975 to Carlisle (KD). 25321 was the 298th Class 25 withdrawn, one of seven retired during September 1986. 25321 was stored at Etches Park from November 1986 until March 1987 when it moved across to the Research Center, remaining here until at least January 1988. It had been sold to the Derby Industrial Museum and moved about May 1988 to the Midland Railway Center, Butterley. Noted Derby Works May 1978 (Classified including fitting of dual braking equipment). Noted Derby Works June 1983 (N4 repairs). With a lengthy career at many London Midland Region depots 7671/25321 saw a considerable number of passenger workings, especially during the latter part of its career. As expected it was well represented on the summer dated services from the Midlands to Llandudno Town, Skegness, Blackpool, Norwich (for Yarmouth) and the Cambrian coast resorts. Condition August: BR emblems on each cabside, two numbers each side behind cabdoors, through steam pipe equipped, straight sided sandboxes, three-rung bogie mounted footsteps. On August 15th a relief Blackpool North - Glasgow Central (via Beattock) was worked throughout by 7671 & 7634. The next day (16th) the same pair were noted approaching Crewe from the north with a passenger train displaying headcode 1M34. Photograph courtesy Tony Sayer Class 25s 7671 & 7634 approach Crewe from the north with an unidentified passenger working on August 16th 1970. The previous day they had handled a Blackpool North - Glasgow relief throughout. On June 3rd 25321 worked the 07.30 Nottingham - Llandudno Town and the return 13.02 Llandudno Town - Nottingham. The remaining passenger trips recorded during 1978 all involve Skegness! On July 19th 25321 & 25313 worked the 08.24 Leicester - Skegness and the return 18.30 Skegness - Leicester. On July 29th it was the turn of 25321 & 25152 to work the 08.52 Leicester - Skegness and the 12.32 Skegness - Leicester. And on August 31st the relief 09.53 Nottingham - Skegness and the relief 18.15 Skegness - Nottingham were worked by 25321 & 25261. On March 8th the 13.25 Forders - Garston brick train was worked by 47321, the return empties, the 01.35 Garston - Forders was handled by 25321. Passenger workings for 25321 during 1979 were heavily involved with seaside locations. On July 21st 25321 & 25249 worked the 08.25 Leicester - Blackpool North forward from Nottingham, returning with the 14.25 Blackpool North - Leicester to Nottingham. A week later on July 28th 25321 & 25261 worked the Walsall - Norwich (for Yarmouth) - Norwich - Derby diagram. 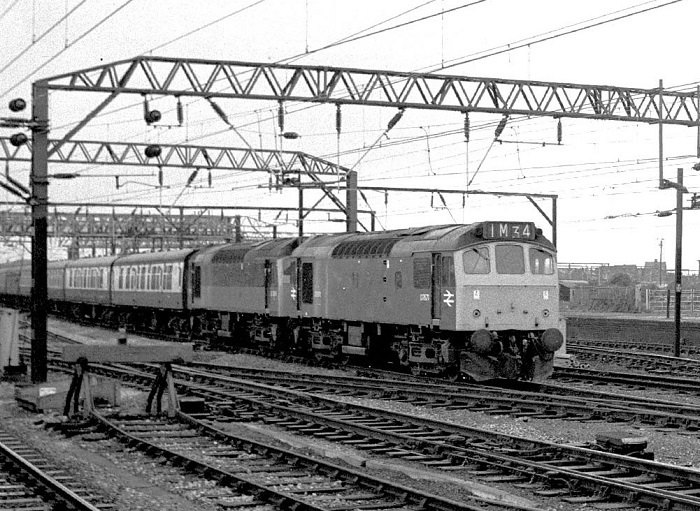 Then the same pair of Class 25s handled four round trips to Skegness, commencing on July 29th with the 09.00 Derby - Skegness and the return 18.15 Skegness - Derby, on July 30th, 31st & August 1st they worked the 08.24 Leicester - Skegness and the 18.50 Skegness - Leicester. After a break of two days, 25321 & 25325 returned to the Skegness run, on August 4th they worked the 09.22 Derby - Skegness and the return 12.58 Skegness - Derby. The next day (5th) the same pair worked the 08.24 Leicester - Skegness and the return 18.30 Skegness - Leicester. On August 25th the 04.15 Shrewsbury - Aberystwyth and the 10.09 Aberystwyth - Euston to Wolverhampton were worked by 25321 & 25032. The next day (26th) the same pair worked the 08.45 Birmingham New Street - Barmouth and the 17.45 Barmouth - Euston to Wolverhampton. On October 13th the return leg of a Stoke-on-Trent - Blaenau Ffestiniog day excursion was worked from Blaenau Ffestiniog to Llandudno Junction by 25321 & 40106. The day out for 25321 & 25302 on August 29th was a lengthy one, working roundtrip a Leamington Spa - Scarborough day excursion for a total of 404 passenger miles. A week later on September 6th 25321 & 25307 worked the 07.40 Euston - Aberystwyth from Wolverhampton, returning with the 17.55 Aberystwyth - Wolverhampton. It was front line duty for 25321 on February 22nd when the 10.05 Kings Cross - York with 55021 became a failure at Huntingdon, 25321 was added to the train, taking the service as far as Peterborough. During March 25321 received an 'E' examination at Tyseley. On June 2nd 25278 & 25321 were northbound at Herefound with the Cranmore - Ellesmere Port bitumen tanks. An unusual, but scheduled, double header was the 03.54 Ditton – Broughton Lane, Sheffield BOC tanks, frequently noted behind a Class 25 & 40, on August 20th 25321 & 40171 worked the loaded tank, then returned with the 15.20 empties. On August 22nd the 08.26 Cleethorpes - Doncaster was worked by 25321. On September 1st (?) 25321 worked a Blackpool North - Glasgow Queen Street service as far as Preston. The failure of 45130 on January 9th prior to working the 18.01 St. Pancras - Leeds saw 25321 & 25207 work the service throughout. On March 18th 25321 was noted light engine at Manchester Victoria. On March 26th 25300 & 25321 worked the 10.17 Stanlow - Bishopsbriggs oil tanks. For some period during the ASLEF strike (July 4th - 18th) 25321 was stabled at Severn Tunnel Junction. Passenger workings during August saw much mileage over Cambrian metals. On August 7th 25321 & 25326 worked the 10.10 Euston - Aberystwyth from Birmingham New Street, returning with the 16.05 Aberystwyth - Shrewsbury. The next day (8th) the same pair worked the 08.45 Birmingham New Street - Aberystwyth forward from Shrewsbury, the 16.40 Aberystwyth - Machynlleth, the 17.25 Machynlleth - Aberystwyth and the 18.15 Aberystwyth - Euston to Wolverhampton. Three weeks later on August 28th 25321 & 25260 worked the 07.40 Euston - Aberystwyth from Wolverhampton, returning with the 14.00 Aberystwyth - Shrewsbury. On September 1st a long distance NE/SW HST failure led to a relief York - Plymouth being laid on with 31176 which failed at Ambergate, 25321 took the train forward to Bristol Temple Meads, where 31256 took over. The first three passenger workings for 25321 during 1983 involved assisting failures. A diesel multiple unit failure on January 18th saw 25321 work the 17.17 Morecambe - Leeds. On February 5th (and/or February 26th) 25321 assisted the 09.55 Liverpool - Glasgow Central to Preston (from?) after 47436 failed. On February 23rd 25321 was noted at Burn Naze (Fleetwood) with the 6T84 ICI tanks trip freight for Warrington Arpley. On March 8th 25321 was noted reversing a train of Presflows from Northenden Blue Circle cement terminal past the signalbox at Skelton Junction. On March 19th another Class 47 failure, this time with 47438 becoming a failure at Blackburn whilst working the LNER 'West Yorkshireman' railtour, 25321 assisted to Healey Mills (see image below). The next day (20th) 25321 was noted keeping company with 25202 at Healey Mills depot. 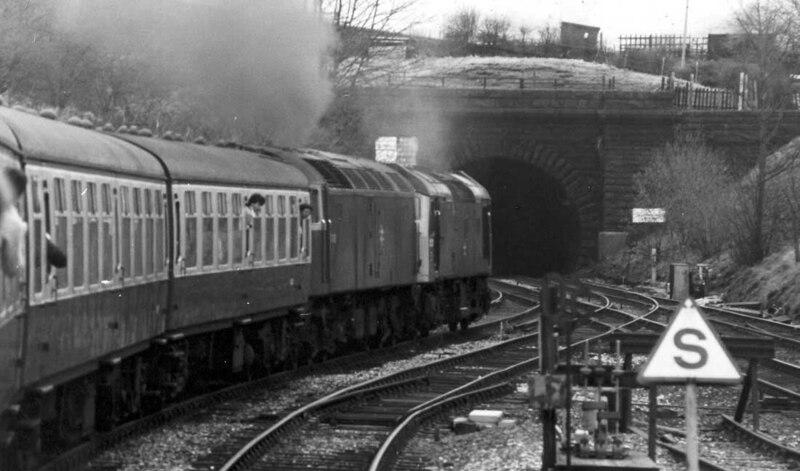 Photograph courtesy Mark Cook 25321 assists an ailing 47438 at Mill Wood Tunnel, between Rose Grove & Hebden Bridge, March 19th 1983. Whilst working an LNER Society special forward from Preston 47438 had become a partial failure, requiring the assistance of 25321. Presumably the view shows the train getting underway at Hall Royd Junction, having come over the Copy Pit line, accelerating off a 20mph restriction, beginning the climb towards Hebden Bridge. On August 22nd 25321 was noted passing Toton with a northbound car train, comprised of nine bogie flats and two short wheelbase wagons, all loaded. On August 27th Nuneaton stabling point included 25076, 25321, 31162/69/91 & 31311, the Class 31s were clearly taking over. A Glasgow Central - Liverpool relief on July 11th was worked forward from Preston by 25321. On November 3rd 25321 worked the 06.45 Derby - Leicester and the 07.48 Leicester - Leeds as far as Nottingham. The early afternoon Tees - Dringhouses Speedlink was worked by 25321 on April 12th. The 'Anglo-Scottish Freighter' railtour on May 4th was worked from Marylebone to Toton by 25321 & 25316. 25321 was stabled at Severn Tunnel Junction on June 2nd. A week later on June 9th 25321 & 25265 worked the 07.35 Euston - Aberystwyth from Wolverhampton, returning with the 14.00 Aberystwyth - Shrewsbury. 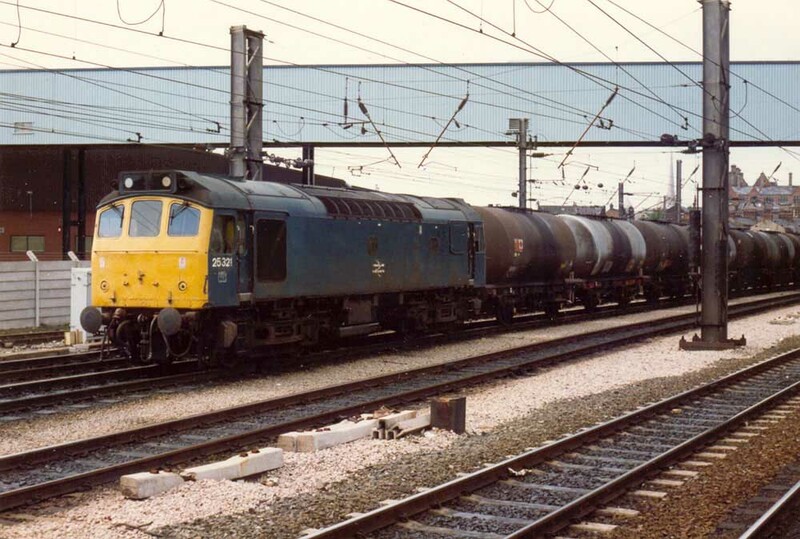 On June 25th 25321 & 25323 worked the 6O34 11.55 Stanlow - Salfords loaded oil tanks, presumably as far as Willesden. On August 31st the 01.30 Holyhead - Birmingham New Street was worked to Crewe by 25321. September 6th found 25321 in charge of the Scunthorpe – Aberdeen Speedlink, being so noted at Northallerton. On September 9th the power was off for engineering work in the Warrington area, the 15.14 Blackpool North - Euston with 86213 was assisted between Preston & Warrington by 25321. 25321 was noted stabled at Warrington Arpley on December 2nd, with seriously fading paint on the No.2 cab. The passenger workings for 1985 produced quite a mix. On February 2nd the 10.20 Birmingham New Street - Norwich failed at Leicester behind 31401, this was removed and 25321 took the train as far as Peterborough where 31124 took over. 25321 was noted at Derby on February 19th on an empty coaching stock movement, the consist included a newly refurbished buffet/restaurant car. From May 1985 to withdrawal 25321 was allocated to Crewe depot. On May 3rd 25321 worked the trip freight from Warrington Arpley with loaded coal hoppers for Deepdale, Preston on the remnants of the former Longridge branch. Empty coal hoppers were returned to Arpley. Also on this day 25321 was noted approaching Arpley with a not quite empty car train. Photograph courtesy Phillip Moore 25321 at Warrington Arpley on May 15th 1985. On June 7th 47616 working the 17.37 Shrewsbury - Euston failed before departure, 25321 dragged everything to Wolverhampton. Three days later (10th) 25321 was noted passing through Warrington Bank Quay with container flats. 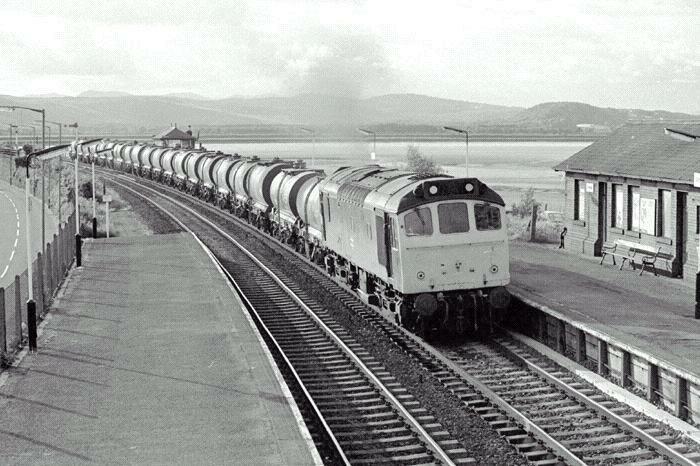 Photograph courtesy John Broughton 25321 with oil tanks at Arnside on June 21st 1985. 25321 was north of the border on June 25th working the 17.40 Carlisle - Glasgow Central. Photograph courtesy Steve Houlker Preston, June 29th 1985. On August 28th the 21.10 Euston - Stranraer Harbour was worked from Willesden to Birmingham New Street via the WR route by 25321 & 25268 due to overhead line damage. On January 15th 25321 was noted passing through Hereford with the 6S75 Severn Tunnel Junction to Mossend freight. On February 7th 25321 worked the 15.40 Euston - Shrewsbury from Wolverhampton, returning with the 19.37 Shrewsbury - Euston to Wolverhampton. 25321 was noted stabled in the bay platform at Severn Tunnel Junction station on February 22nd/23rd. On April 5th 25321 was noted stabled at Shrewsbury (the three piece miniature snowploughs were still fitted). 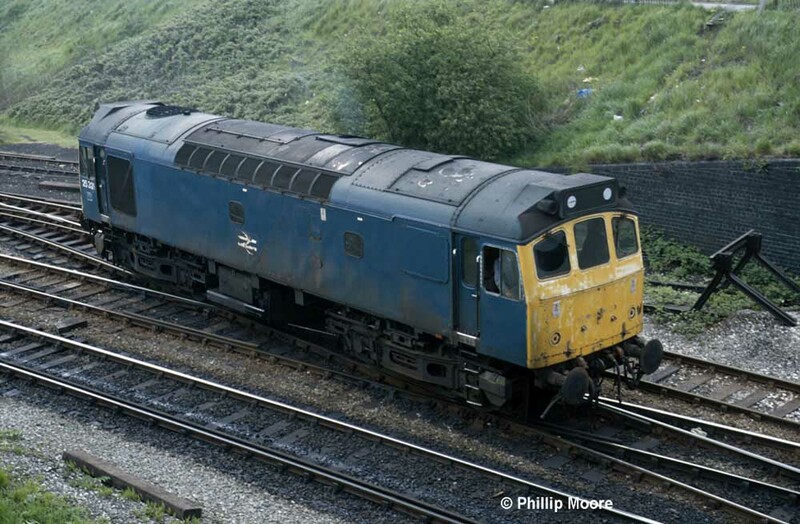 Margam was host to 25321 on May 25th after working the Partington – Briton Ferry tanks. The last recorded passenger working for 25321 took place on July 2nd when the 18.15 Llandudno Town - Blythe Bridge failed at Chester behind 47447, 25321 & 25249 took the train forward to Blythe Bridge. On July 14th 25321 handled the trip freight from Gloucester to the small coal depot at Stonehouse, about twenty coal wagons were sorted at Stonehouse. The next day (15th) 25321 was stabled at Saltley depot. 25321 was noted passing through Abergele on July 23rd with one track machine, a coach and a brake van. On August 6th 25321 headed north through Crewe with a load of Railfreight vans, possibly from ROF Radway Green. Six days later (12th) 25321 was noted departing Tyne Yard with the 7S81 Tyne Yard - Millerhill. (The three-piece miniature snowploughs were no longer fitted). 25321 was withdrawn on September 29th 1986. Afrer withdrawal 25321 was stored at Etches Park from November 1986 until March 1987 when it moved across to the Research Center, remaining here until at least January 1988. It was sold to the Derby Industrial Museum without being put on any tender lists. 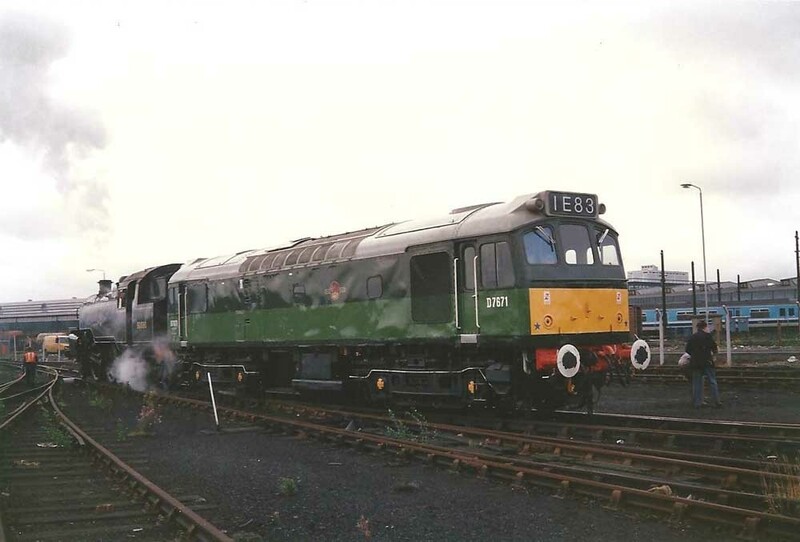 The museum had plans to repaint the Class 25 into two-tone green livery (which it never carried in BR service) and place on a small section of track in front of the museum. The museum had considered the purchase of 25327, the last of the Class 25 build, but its derelict condition at Vic Berry, Leicester and the presence of asbestos made this a poor choice. Despite the plans for 25321 to be a static exhibit, the museum intended to ensure that the Class 25 could become operational in the future. About May 1988 25321 moved to the Midland Railway Center, Butterley. Photograph courtesy Ken Cook On a dull September 16th 1989 two-tone green liveried 7671/25321 is positioned for display at the final Derby Locomotive Works Open Day. This must be the last Class 25 to visit the premises of Derby Locomotive Works, albeit as a visitor and not as an occupant of the Works for repair. Page added January 5th 2012. Last updated September 9th 2018.